Revisions: a promising word that grows out of a hopeful thought: to see again. I’ve spent the better part of the past six weeks revising pages I’d “finished” two or three times already. More than once, I have gone still before my computer screen and thanked Allison Hunter who asked me to look again; to see them anew. Those pages are now in her capable hands as she seeks a home for them. We both know, of course, that, if she does, more revisions are likely. Good. That’s the kind of problem I’d love to have. I’m grateful for every chance I get to see my work in a new light and make it better. That’s what I tell myself when I take the ax to whole scenes, whole chapters, whole characters. After the shuddering is over, I see with new eyes what remains and what remains to be written. It’s the end of the summer session during my second year in college. I’m wheeling my two year old and his stroller out of the University of New Hampshire library when I run smack into the teacher and writer who introduced me to my journalism career. The sight of him panics me, in a good way. We rarely chat outside the classroom; he carries himself with reserve, delivers his critiques in short, blunt, phrases. I live in fear that I will disappoint him but I want to connect. “How was your vacation?” I manage to say. Yes, I said that. Yes, he looked at me as if he was reevaluating everything he’d thought about me. And no, I cannot to this day tell you where that response came from or why it flew out of my mouth so readily. Or, there was the time my little Mercury Lynx was crammed with five 13-year old boys, fresh from their eighth grade graduation, flush with the spring, a whole year of being at the top of the middle school pecking order, and the girls who had in the last six months or so taken an interest in them. They brayed and squeaked — depending on how kind puberty had been so far — about the girls who liked them. I’d seen the girl my son liked, thirteen with a body going on eighteen. She’d given him some attention. He saw himself going into high school with this woman by his side. Life was good and only going to get better. My comment was greeted with guffaws of disbelief but of course, we all know what happened. It wasn’t pretty. If I had it to do again, I’d keep my mouth shut. There are thousands like this. I could make a list of all the days I would revise if I could. On good days, I comfort myself with the knowledge that these are the mistakes I had to make to grow more aware, stronger, more compassionate, more patient. Like my novel, I am a work-in-progress. If you are in a sharing mood, feel free to offer moments you’d gladly revise if you could or your experiences with revisions. 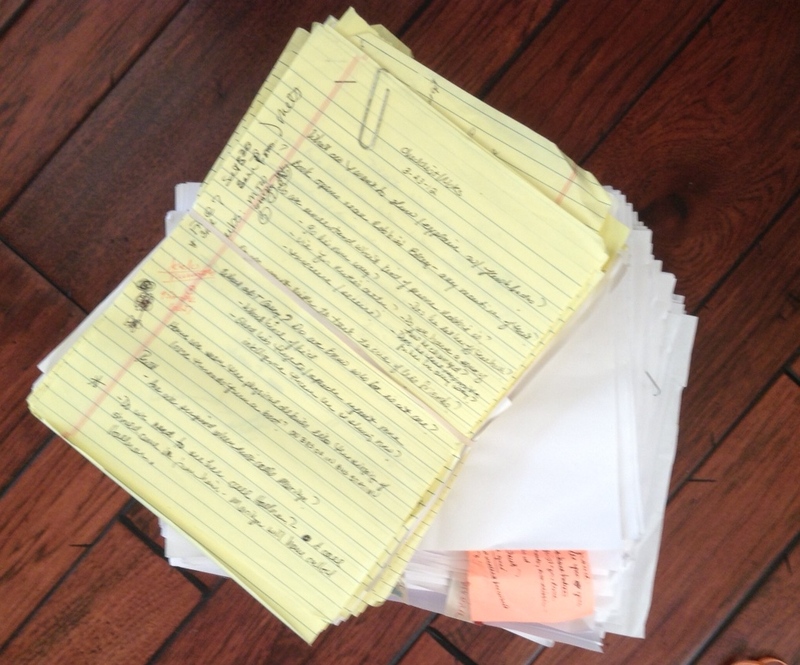 In my next post, a few words about what to do with all the pages that are cut. If you have some creative ways you’ve put your rough drafts or rejected manuscripts to use, fire away. We’ll pool resources on the next post. Betsy, It was so cool to see those pages that I’d read sitting there in the photo, with words I remember, and to know that this story is now in the capable hands of an agent. Amazing and awesome. It really is amazing how often we think our story is done, only to have someone force us to see it again and realize, well, okay, I guess it’s not done. It’s a feeling I know only too well. Best of luck! But I don’t think you’ll need luck, because your novel will sell. I can’t wait to buy it and have you sign it! Thanks, Jim. I think we can safely say that I held back some of the very worst moments. That “tinge” you describe is certainly something I am familiar with. I know, Beth — the “not thinking” part always leads me to wishes for a do-over too. I love this post. Even though I have only just started to write again after many years, I too well recognise the need for constant revision – my first few blog posts have taken an age to revise and tweak – and I am still never happy with the finished article. Is that not the writers curse? We always know it could have been that little bit better! I like the notion of being able to revise episodes in our lives – like Jim I have too many to recount, and that are far more embarrassing! Though one would be when I asked my then girlfriend to marry me. We had spent a a glorious day on the coast and I had written “I love you” in giant letters in the sand on the beach, and as we stood on the cliff top above the sky was blue and the message stood out on the sand and we were alone – thats when I should have gone on one knee and asked her to be my wife – but I didn’t! I asked her the next day, sat on the bed in her student nurses room – a scene a million miles from the one at the beach. Thankfully she still said yes! So, David, you may not have had the opportunity to revise the missed opportunity but how wonderful that you got another one. Who knows, without the glorious day that preceded it, maybe she would have said no! Well we do laugh about it now! And perhaps there is something in what you say, perhaps it would have been too perfect! But 25 years later here we are! Elizabeth, I’ve pretty-much given up blogging in order to make time for revisions. It seems the ratio is an hour of creative wring means a month of revising.to revise.There are four turning points in my life where I would like a do-over, or a revision. Unfortunately, all are too painful to share. Congratulations on achieving agency and moving forward with your WIP. Yes to finding a home for Ruth! I am so excited for both of you. I just love how you write, how you take the quotidien and weave in the universal. There are SO MANY things I would revise. Mostly what I would revise is not always what I said but how I acted or reacted in anger, mostly towards my older son. Even if I kept my mouth shut, it was my face that gave away my feelings or the way I slammed a car door and sometimes that is even worse than words. So I guess I would revise my quick reactions and replace them with a more gentle response. You’re right about the nonverbal responses, Pamela. A face can say a ton even when we wish it didn’t. Here’s to gentleness and many chances to feel it. 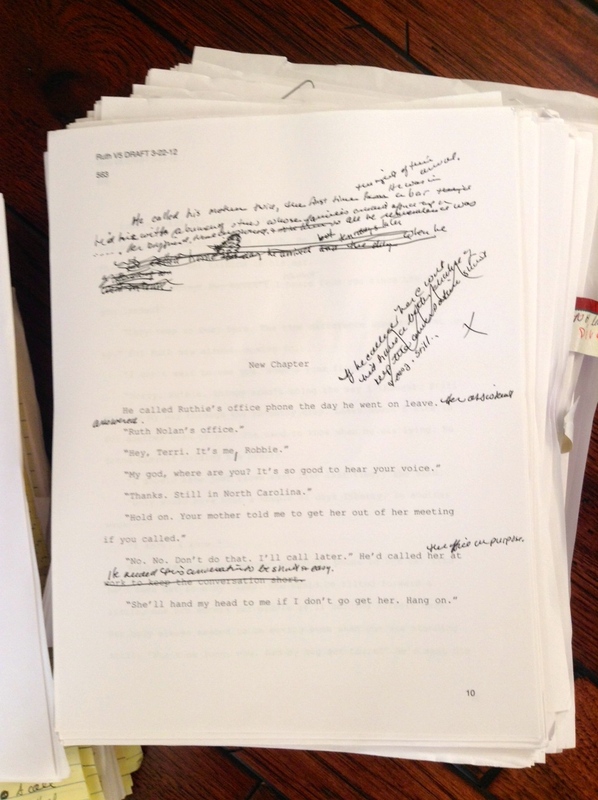 Thinking about revisions I’d like make in my life opens up a place of deep sadness in the heart — because, of course, there is no going back, much as I wish I could gently repair pieces of my past. And so your beautiful and provocative post is inspiring me to write the page of today with more awareness, to get it right the first time by moving slowly, speaking carefully, loving fully, not wasting a minute. Moving slowly often means less waste, doesn’t it? Fewer regrets, too. Thanks for your kind words and reinforcement of what is important, Katrina. And peace to you, John. Thank you for those wishes!